The mailbox post is an integral part of almost any curbside mailbox and compliments the style and material of the mailbox itself. Mailbox posts have a basic practical purpose. They need to be durable enough to hold the weight of your mail and packages and adequately resist the weather elements. But they can also incorporate elements of decorative flair and style that become a part of your home’s overall architectural design. Your home’s facade makes an important impression on individuals who view your home. A decorative mailbox post can serve as an excellent ornament to reflect your personal style and architectural preferences. Giving your home a unique identity is part of the reason for decorating your home and a decorative mailbox with a unique mailbox post will definitely stand out to the public. Whether you choose a side mount mailbox post or a rear mount mailbox post, many materials are available for your choice, including stainless steel, cast iron, and aluminum. Plus, added features consisting of other materials are sometimes incorporated into the design as embellishments. Take a look at our decorative mailbox posts and see how a quality, decorative curbside mailbox with a unique mailbox post with can enhance your home’s overall appearance. Mailbox posts made from metal are a great choice for strength and durability. There are several forms of metal mailbox post packages that we offer. Our inventory contains a multitude of aluminum mailbox post choices. Many are made of solid cast aluminum and are powder coated to prevent rust and give your mailbox and mailbox post a long useful life without deterioration. Another metal post option includes the stainless steel post and mailbox that reflects a handsome design and provides long-lasting, weatherproof service. 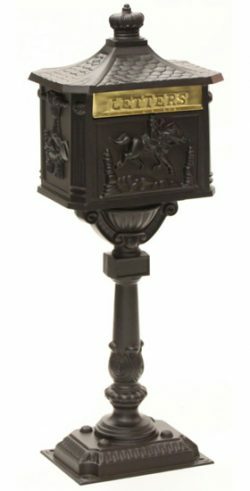 Be sure to view all of our decorative mailbox posts to see every available option we carry. Another unique mailbox post in our inventory is the iron style mailbox that is constructed of cast aluminum. 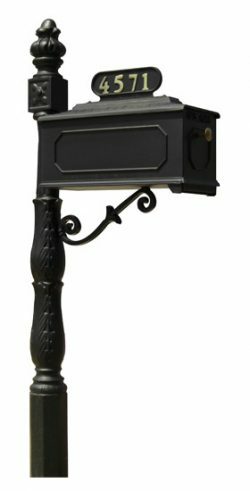 These post and mailbox combinations look like genuine cast iron but are constructed of cast aluminum for continual rust-free use. Check out our Keystone Mailboxes with deluxe mailbox post or view our Coronado Mailboxes for more mailbox post options. Visit our Post Mount Mailboxes to see our entire selection. A mailbox post with 2 mailboxes or 3 or more mailboxes can be utilized in areas where two or more mailboxes are needed at one location. The dual mailbox post is a perfect choice. This type of mailbox post mounts to mailboxes that are able to receive various size packages depending on the particular model. These dual post and mailbox options are also coated with a powder coat paint finish to provide maintenance free use. Our inventory contains several handsome models of double mailbox posts as well as triple and quad mailbox post combinations. Of particular note is our Whitehall mailboxes dual post product. This unit is available in black, bronze or white weather-resistant powder coated finishes. It comes with the option for personalized custom front plaques to make your mailbox truly unique. For more information about pedestal mailbox post options or to inquire about a decorative mailbox and mailbox post combinations, including our multi-mount mailbox post, please call MailboxWorks toll free at (866) 717-4943 or Contact MailboxWorks. We’d be glad to answer any of your questions. MailboxWorks also sells residential wall mount Mailboxes.